About Coeur, Inc. | Coeur, Inc. | We make quality and innovation affordable. 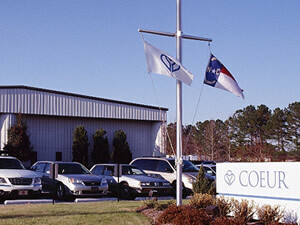 Coeur OEM is a state-of-the-art designer and contract manufacturer for the medical and commercial marketplace with manufacturing and assembly operations in North Carolina and Wisconsin. In addition to manufacturing and assembling its own proprietary line, the company offers a full complement of services ranging from design, molding, tubing extrusion, assembly and packaging of medical devices. Coeur OEM also provides regulatory support including 510(k) submissions and sterilization services to the medical marketplace. To reduce the cost of quality patient care with innovative and affordable products and services for the global healthcare market. To be an international leader in the manufacture and sale of single patient use products and services for the medical imaging market. To meet and exceed our customers’ expectations for quality, timeliness, responsiveness and cost-effectiveness. To improve stakeholder value through aggressive and profitable internal sales growth combined with a targeted external acquisition strategy. To preserve stakeholder value by creating an organization that is flexible, adaptable, and focused on long-term sustainability. Coeur is guided by a set of principles that create a standard of professional conduct within our enterprise. We believe that our long-term success is dependent on the culture these principles create. Promote a culture that focuses on customer satisfaction. Couer seeks to involve all employees in the total satisfaction of a customer’s need. Conduct ourselves with the highest level of integrity. Coeur encourages mutual respect, an attitude of personal ownership, and an overall sense of fair play. Cultivate the human resource. Coeur promotes a high-energy work environment that is fun, rewards hard work and encourages personal improvement. Pursue innovation through advanced technology. Coeur will utilize appropriate and effective technology to ensure our profitability and long-term prosperity. Maintain a relentless pursuit of Quality. Coeur is dedicated to the concept of continuous improvement through the disciplined use of our Quality System. I work for a healthcare company. Through my work, I will constantly strive to improve the quality of care for my family, friends, and for people I will never know. Be audit ready all the time. I will never forget that a person’s life may depend on what I do and how well I do it.